The “post-9/11 world” is now a catchall phrase, describing a global change in consciousness regarding security, privacy, religion, and geography. From boarding an airplane to grappling with the ramifications of drone warfare, the effects of 9/11 are woven into the most mundane and most profound aspects of Americans’ lives. 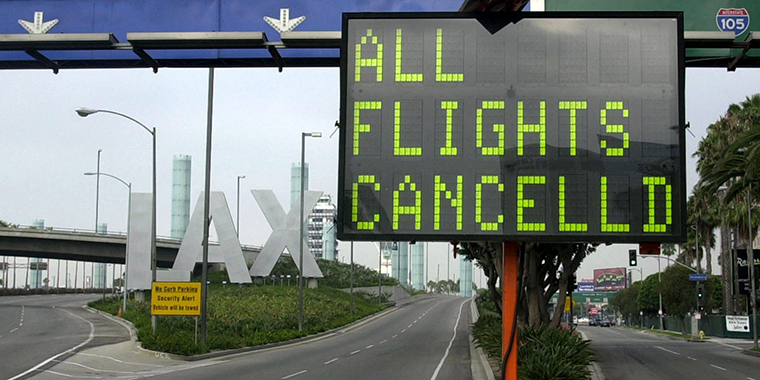 A sign flashes that all flights are canceled at the Los Angeles International Airport, on September 11, 2001. The September 11, 2001, terrorist attacks targeted the symbolic centers of American industry and security, killing 2,977 people. Following the attacks, Congress passed a series of laws, reorganizing and empowering intelligence agencies and the military in order to combat the threat from terrorism. Many of these measures have served as the foundation of U.S. foreign and domestic policy for the last fifteen years and are still in place today. In particular, the 2001 Authorization for Use of Military Force (AUMF) has been interpreted—many experts say—far beyond its original scope, serving as the justification for almost two decades of counterterrorism policy. Though the president is commander-in-chief of the armed forces, the White House needs Congress’ permission to use military force abroad for any operation lasting longer than three months. Lawmakers can either declare war, giving the president broad powers, or they can pass a law authorizing a narrower scope of military operations. AUMF laws serve as that authorization, and they typically restrict military action to specific locations and time frames. This law has been used to justify some of the most significant national security policy and operations since 9/11: the war in Afghanistan; the Guantanamo Bay detention facility; warrantless wiretapping of U.S. citizens by the National Security Agency (NSA); drone strikes in Somalia, Syria, and Yemen; and airstrikes against the self-proclaimed Islamic State. The 2001 AUMF served as the legal basis for the invasion of Afghanistan. Operation Enduring Freedom targeted al-Qaeda (which “planned” and “committed” the attacks) and the Taliban (which “harbored” al-Qaeda). The invasion was launched with the United Kingdom on October 7, 2001, and it represented the first major policy step based on the AUMF. President George W. Bush issued a military order in November 2001, outlining his administration’s plans for the detention, treatment, and trial of enemy combatants in the war on terror. His order led to hundreds of alleged al-Qaeda members being detained in Guantanamo Bay. Bush maintained that the 2001 AUMF authorized him to detain suspected terrorists. The detentions faced legal challenges, but in 2004 the Supreme Court upheld the president’s authority to detain enemy combatants, calling it a “fundamental incident” of the use of military force. According to the Bush administration, the 2001 AUMF not only authorized military action abroad but also permitted intelligence operations within the United States. In 2005, a New York Times story revealed that the NSA had been wiretapping U.S. citizens without warrants since 2002. The monitoring captured international calls and emails that authorities thought might be linked to terrorist activity. 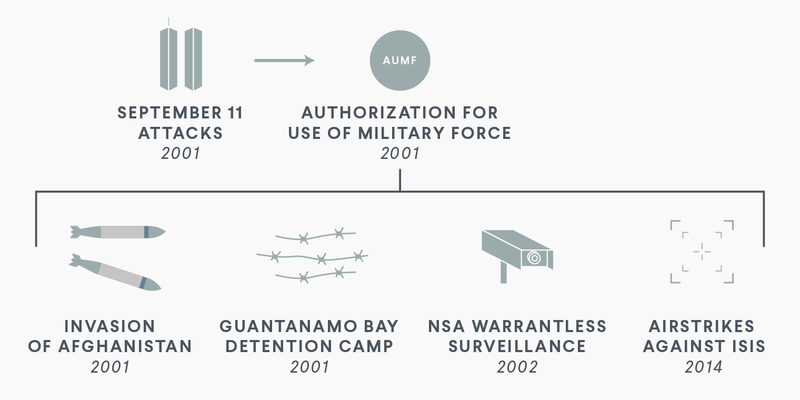 The Bush administration pointed to the AUMF as legal justification for the so-called Terrorist Surveillance Program. Using the Supreme Court’s 2004 ruling on the AUMF, U.S. Attorney General Alberto Gonzales equated the necessity of gathering intelligence to the need for detaining enemy combatants, both “fundamental incidents” of using military force. In response to the ensuing public outcry over privacy concerns, Congress set broad legal constraints on the NSA’s Terrorist Surveillance Program. The program was significantly rolled back under the Barack Obama administration. In addition to al-Qaeda and the Taliban (clear targets of the 2001 AUMF), the United States has also taken military action against the “associated forces” of those organizations. The phrase “associated forces” is not included in the 2001 AUMF; instead, the Bush administration began using it as a reference to groups fighting alongside al-Qaeda or the Taliban against the United States or its coalition partners. White House officials argued that the 2001 AUMF authorizes attacks on these associated forces and have used that argument to support airstrikes, targeted killings, and ground operations against groups such as al-Shabab in Somalia, the Khorasan Group in Syria, and al-Qaeda in the Arabian Peninsula in Yemen. The self-proclaimed Islamic State is a more high-profile example of an associated force. The group did not exist when the AUMF was passed, and it has been in open conflict with al-Qaeda since 2014. Regardless, the Obama administration considered the Islamic State an associated force and took military action against the terrorist group. In 2015, Obama pressured Congress to pass a new AUMF that would more specifically cover action against the Islamic State, but lawmakers failed to come to an agreement on the scope of any new authorization law. 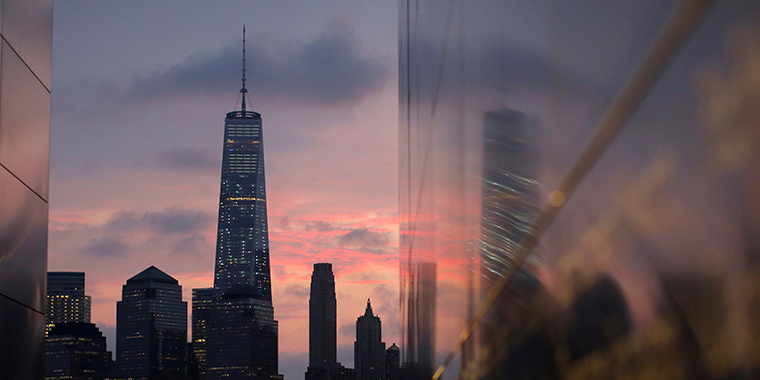 Lower Manhattan is reflected in the Empty Sky memorial in Jersey City, New Jersey, on the morning of the fifteenth anniversary of the 9/11 attacks. The 2001 AUMF remains operational almost two decades after the 9/11 attacks because the original text did not include sunset provisions or a review process. While past force authorizations did not necessarily include timing restrictions, they would implicitly end when the enemy was defeated. The 2001 AUMF is unique in that it authorizes the use of force against not only other nations but also unspecified organizations and individuals. The law’s failure to define a distinct enemy makes it difficult to determine whether the United States has finally achieved the goal for which military force was originally authorized.